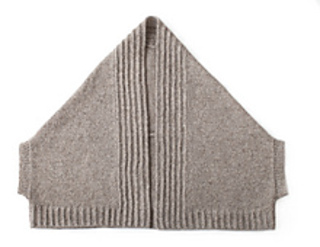 This deceptively simple cocoon cardigan is inspired by Japanese origami. Constructed from two simple rectangles, the relaxed and cozy fitting sweater can be worn right side up or upside down. It’s the ultimate ‘comfort’ sweater and is equally appropriate at home over your pajamas, or out with a pair of slim jeans and a long-sleeved shirt. 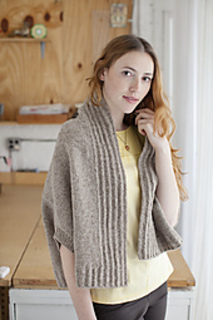 With only three seams (and one graft), this is a quick knit with a great end result! Note: Your Gauge Needle for both stitch patterns may differ. It is recommended that you swatch both patterns to determine correct needle sizes. 27 (28, 28½, 30, 30¾, 31½)“ length at center back (from nape to hem), 30¼ (31¾, 33, 34½, 36, 37½)” across, from armhole-to-armhole Garment measures 60½ (63½, 66, 69, 72, 75)“ in circumference after assembly.